Learn from the expert. Advance in the real estate industry. Grow your career. Do you have what it takes to be an effective sales professional? This is your time to break through into the real estate industry. Whether you’re looking for a full-time work or a part-time job to supplement your income, this could be the opportunity you’ve been waiting for. 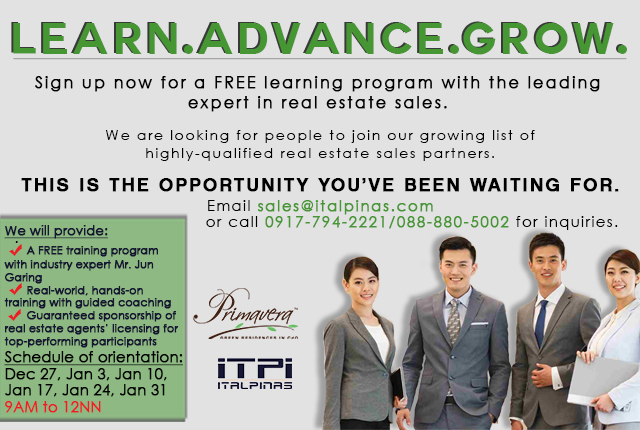 Sign up now for a FREE 3-month learning program with the leading expert in real estate selling, Mr. Jun Garing. Jun Garing is a prominent sales trainer and motivator who has trained more than 100,000 salespeople for the past 30 years. He installed corporate systems of selling to over top 1000 corporations nationwide. Recognized as one the Outstanding Salesmen in the 1976 and 1977 and from then on, he has received numerous awards and citations from various sales and marketing associations in the country and nearby Asian regions. He is also the first Filipino certified trainer of Motorola University on Sales Training in 1995 and authored the first book on selling: The Filipino Art of Breakthrough Selling. Primavera Residences is looking for a roster of future sales professionals to join our growing list of highly-qualified real estate sales partners. Starting this December to March 2015, registrants will be invited to a weekly learning session at 2/F Primavera Residences, Pueblo de Oro Business Park, Cagayan de Oro City. First batches of orientation are scheduled on the following Saturdays of December 2014 and January 2015: December 27, January 3, January 10, January 17, January 24 and January 31. Orientation is at 9am to 12 noon at 2/F Primavera Residences. Registrants will learn how to break through into the growing real estate industry by learning advanced selling techniques from the expert FREE of charge. What are you waiting for? The booming real estate industry in Cagayan de Oro needs you now. Sign up and be counted. Registration may be done through the following, via Facebook at www.facebook.com/CondoPrimavera, through emailing sales@italpinas.com or by calling 088-880-5002 and 0917-794-2221 (look for Gladys or Tin).